Picture by SANDY McCOOK 5th October '17 The coffin of Lord Lovat in the Wardlaw Mausoleum in Kirkhill was opened yesterday by forensic anthropologist Professor Sue Black. 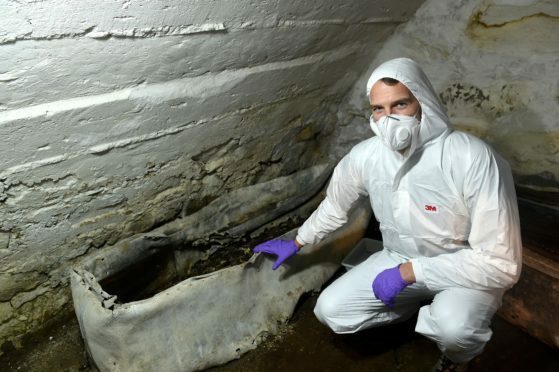 TV presenter Dan Snow in the crypt with the open coffin. Experts felt they were closer to answering the question of where the notorious clan chief, known as the “Old Fox,” was buried after exhuming remains from a clan crypt in the Highlands. Simon Fraser, the 11th Lord Lovat, was beheaded at the Tower of London in 1747 for his support of Bonnie Prince Charlie and the Jacobite Rebellion. Official accounts say he is buried under a chapel floor in the tower, but the clan claimed his body was taken by his supporters and returned to Scotland in a lead casket. But earlier this year, Scotland’s top anthropologist, Dame professor Sue Black, was able to reveal with confidence that the body in the Wardlaw Mausoleum in Kirkhill, near Inverness, was not the 80-year-old, 6ft Jacobite clan chief – but that of a woman in her 20s or 30s. Dame Black found instead that the remains were those of five different people, with the most complete remains actually those of an unknown, headless young lady. It is thought the other remains in the coffin were most likely graveyard clearance from other burials in the graveyard. Members of the Lovat Fraser family have now been invited to attend the “reinterment” of the remains during a service at the mausoleum on Thursday, August 23, at 11am. The service is being made open to other Frasers and members of the public with an interest in the mausoleum and the Lovat Frasers. The forensic team had travelled to mausoleaum last year to examine the remains of the headless body. The team carried out detailed investigations using modern techniques, including DNA testing. In January, Dame Black told an audience of more than 400 at a special event in Inverness that the debate now is how the remains of an unknown woman was in the crypt. One possible explanation is that those sent to collect Lovat’s body from London were unsuccessful and, rather than having been seen to fail, they took the body of a poor stranger and removed her head before returning.